XCFit a.k.a (XCUI, Cucumberish and Fitnesse Integration Tests) is a full stack Xcode BDD framework for iOS apps written in Swift. 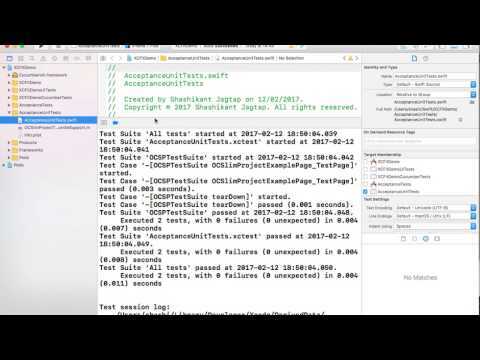 XCFit allows us to write BDD Style API/Contract level, UI and Acceptance Tests with Swift in human readable language using tools like Given/When/Then, Cucumber and Fitnesse in Xcode. We can still use Apple's brand new UI Testing framework (XCUI) under the hood of XCFit and Cucumberish. XCFit provides automated Xcode templates to setup skeleton of BDD which are available on Homebrew, RubyGem. XCFit also packaged as Swift Framework to provide pre-defined BDD Steps written in Swift for Protocol Oriented BDD. XCFit Swift framework is available on CocoaPods, Carthage and Swift Package Manager. Important Note : XCFit does not support macOS application. You can now write Given When Then (Gherkin), Predefined BDD Steps and Decision Table in Xcode. In Short, you can do BDD in Xcode for your iOS app. XCFit is purely in Swift so no need to use other languages like Ruby, Java, Python to write acceptance and UI tests for iOS. XCFit provides automated Xcode Target Templates for Protocol Oriented BDD, Page Object Pattern, Cucumberish, Fitnesse and Page Object Pattern(XCUI) targets which reduce hectic Xcode configuration steps. It also arrange code in Xcode groups. XCFit will setup Xcode Templates with skeleton code and provide BDD Style Steps with Swift Framework which is available on Cocoapods, Carthage and Swift Package Manager. XCFit provides templates for Protocol Oriented BDD using 'Protocol BDD Bundle' and Page Object Pattern for Apple's XCUI Test using 'XCUI POM Test Bundle' Templates. We can get pre-defined BDD steps by using XCFit Swift Framework from CocoaPods, Carthage and Swift Package Manager. XCFit setup Cucumber style BDD framework with "Cucumberish UI Test Bundle' Templates. XCFit allows us to setup Fitnesse style decision table test framework with OCSlimProject using 'Acceptance Tests Bundle' templates. CocoaPods -- XCFit-CocoaPods : XCFit Swift Frameworks and BDD Style predefined steps for the iOS App to support Protocol Oriented BDD. Swift Package Manager -- Swift Package Manager doesn't support iOS projects yet but XCFit is compatible with Swift Package manager as well. The Rubygem method is preferred. XCFit is pure Swift but other libraries like Fitnesse and Cucumberish need some additional softwares. You must have Mac Operating System with OSX/MacOS Sierra or above. XCFit currenly support Swift 3.0 and Swift 3.1. Ruby is required to setup XCFit templates either using Homebrew or Rubygem. Use RVM for GEM management. Ideally Ruby > 2.X. You can use system Ruby with sudo. Might be pre-installed but worth double checking. Fitnesse - Optional : You might need to have iOS-Sim, Java if you want to use Fitnesse. XCFit installation has two steps. This will install Xcode Templates with skeleton code to support BDD in iOS app. The templates are XCUI based Protocol-oriented BDD templates, Page Object Templates, Cucumberish BDD Templates and OCSlim Fitnesse Templates (optional). The templates can be installed with xcfit-RubyGem or Homebrew. You need to select only one method of installtion. The rubygem method is preferred. XCFit Swift Framework provides pre-defined BDD Style steps with XCUITest to support Protocol-oriented BDD and writing tests using Page Object pattern. The supporting Frameworks like Cucumberish and OCSlim which can be used to write BDD Steps. XCFit Swift Framework is available on XCFit-CocoaPods, Carthage and Swift Package manager. Cucumberish and OCSlimProject are available on Cocoapods. XCFit templates can be installed using Rubygem. You need to use with 'sudo' if you are using system (pre-installed) Ruby(2.0). XCFit gem will be used to set all the Xcode Templates for Xcode. You can choose any of the above method. Rubygems method is prefered. To setup Templates for Xcode 8 for XCUI ptotocol-oriented BDD, Cucumberish target and Gherkin File Type. You will see new option for iOS i.e 'XCFit'. Once Clicked on it. You will see Protocol BDD, Cucumberish UI and Fitnesse Acceptance Tests. XCUI POM, Fitnesse Acceptance Unit Test bundles. Note: With Xcode 10 New Build System, This target generated duplicate build phases like Compile Sources, Link Binary with Libraries, Cou Resources etc which blocks build. Workaround is simple visit the Target----> Build Phases and remove the duplicate build Phases. XCFit, Cucumberish or OCSlimProject Framework can be installed using Cocoapods. XCFit and Cuucmberish can be installed using Carthage as well. Cocoapods is quicker and more automated than Carthage. We can create Podfile and add specific dependency for the target or we can use XCFit template Podfile using command. This will create a Podfile, you need to replace your XCFIT, CUCUMBERISH or FITNESSE target names as required. You can use any of the method above to setup Podfile. You need to close the existing Xcode session and Xcode Workspace .xcworkspace next time. Now, we can fetch and build Carthage Dependencies using following command. You can choose any of the above method but Cocoapods is easy and less manual. XCFit can be installed with Swift Package Manager however Swift Package Manager isn't officially supported for iOS so we can use XCFit only for the standalone Libraries. We need to create Package.swift file with following content. We can build, test package using the Commands available for the Swift Package Manager. Once Clicked Xcode will create UI testing target with properly structured Xcode Groups and required files. You can then make physical directories on Disk Or change the folder/group structure as per your need. You may want to delete autogenerated UI test from Apple's standard template. You don't have to so any setting to run those demo XCUI tests. Just CMD+U and You are good to go ! What's in the Protocol Oriented BDD Template ? All the XCUIElements for that Feature. 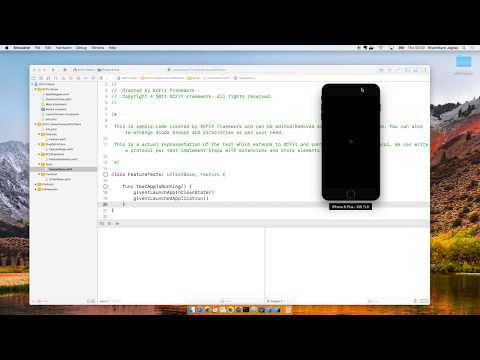 UITestBase.swift This is a base class for all the Test. Once XCFit imported then we can extend this class with XCFit to get the pre-defined steps. You can get XCFit Framework easily with methods mentioned above. If you choose decided to use Cocoapods then create Podfile and add specific dependency for the target Cocoapods is more automated than Carthage. We can create Podfile and add specific dependency for the target or we can use XCFit template Podfile using command. This will create a Podfile, you need to replace your target names as required and then follow the instructions above. There are some predefined XCFit steps we can use by importing XCFit and extending out test class to XCFit. There are plenty of Pre-Defined BDD Style Steps available here. You can use predefined steps wherever they make sense however it's fairly easy to write your own. XCFit templates gives an option to use very polular Page Object Pattern with Apple's Xcode UI Testing framework. You can install templates and start using the code straight way, no need to use framework unless you want to use pre-defined BDD style tests. Once Clicked on the target e.g 'XCUI POM Test Bundle' Xcode will create UI testing target with properly structured Xcode Groups and required files. You can then make physical directories on Disk Or change the folder/group structure as per your need. What's in the XCUI POM Template ? This file is at the base of the target. It's exactly same file that Apple's XCUI Test generate at first. You may use it for recording the tests or simply delete it if not needed. This is groups where we can abstract logic of every screen in the app. Example file are 'HomeScreen.swift' and 'BaseScreen.swift' This assumes that your apps is made up of multiple screens. You can write individual screen class which extend BaseScreen. All the functionality related to screen can be included in this class. This group has all the test for our app. Currently demo template has two tests 'HomeScreenTest.swift' and 'ProtocolOrientedTest.swift'. This examples shows how XCUI test can be implemented in the Object Orinted way and Protocol oriented way. You will get access to lots of predefined BDD style human readable steps. It's not mandatory to use those steps unless you wish. This will run all our tests using Fastlane that will be easy to plug it with any CI server. Once Clicked on the target e.g 'Cucumberish UI Test Bundle' Xcode will create UI testing target with all the required files with Bridging header for Cucumberish UI Testing. It create Page Object Pattern with all required files with screens, steps definitions and Cucumberish initialiser swift file. Let's see what is inside the Cucumberish templates. What's in the Cucumberish Template ? This file is at the base of the target. This initiate Cucumberish for project. We need to register all step definitions in this file. This is groups where we can abstract logic of every screen in the app. Example file are 'HomeScreen.swift'. This groups has all the step definitions related to screen. Example file 'HomeScreenSteps.swift'. Once implemented we need to register it in the initialiser file mentioned above. This group has common code like extensions and common steps. The example file 'CommonStepDefinitions.swift' has some steps that can be used in the feature file. This groups all the Objective-C headers and Bridging headers needed to get Cucumberish working with Swift. We don't have 'Features' directory in the template because it needs to have directory on the disk and should be added to Xcode as 'Folder Reference' not Group. Create a Direcory called "Feature"
Now, We have to get cucumberish framework either using Carthage or Cocoapods. Cucumberish is one of the dependency of XCFit so you will get Cucumberish with XCFit while using it with Cocoapods however Carthage need more setup. Now close the existing Xcode session and Xcode Workspace .xcworkspace next time. Congratulations !! You have just ran your first Cucumber BDD Scenario in the Xcode. XCFit adds 'Cucumberish' target to existing Scheme. You can remove that target and run separate scheme to keep it independent from Unit tests. Make sure you make the new scheme executable for Running. This will chekcout and build XCFit and Cucumberish frameworks inside the Carthage directory. Now we need to manually drag and drop frameworks in the build phases of the Cucumberish target. Add New Copy Files Phase and select destination as 'Frameworks' and Add Cucumberish Frameworks from Carthage/Build/iOS directory. Select 'Create Group' and 'Copy if needed' when prompted. XCFit has pre-defined steps for both XCFit Swift framework as well as Cucumberish framework. It's recommended to use your own steps as predefined steps might not read well for your project needs. Pre-defined steps gives you guidance on how to implement your own step, however you can use pre-defined steps wherever they make sense to avoid duplication. You can easily override pre-defined BDD Style Steps by writing Swift Extensions and Changing Common step definitions in the Cucumberish 'CommonStepDefinitions.swift' file. Now you can use your own givenMyiOSApplicationHasBeenLaunched() step anywhere inside the Test target. XCFit template for setting Cucumberish has the Swift code for the all pre-defined Cucumberish BDD Steps inside the 'CommonStepDefinitions.swift' file. You just need to add your own steps accordingly or change the exiasting one. The build might fail as we need fix some Swift3 related issue as well as we need to add XCFit/OCSlimProject Pod to the to the podfile. Now, You should be able to build 'Acceptance Tests" target. So, Congratulations again.. You have just executed Fitnesse test fro browser which is talking to your app. Run XCUI and Cucumberish test with Xcode using 'XCFit4Demo' Scheme, press "cmd + U". You can also use "AcceptanceUnitTests" target/scheme and press "CMD+U" to run fitnesse tests. You can script it with xcodebuild or Fastlane Tools. Cucumberish : Provide native Gherkin parser for iOS Apps to enable BDD in Xcode using Given When Then. Yay! This is special release of XCFit as it's been done from Cupertino. This release contains major changes like adding XCTActivity support for all the predefined steps and new templates for Xcode 9. This file has all template targets which we need to replace with real targets. We can then use pod install to install dependencies.